Of all the Van Morrison albums I own, that's all of them, this is one of those that I have always played the least. I know of no real reason for this. It has a superb sound quality and an appealing poppiness to a lot of the tracks. Certainly the two albums either side of this one - the bluesy "Too Long in Exile" and the soulful "The Healing Game" have always appealed to me more. That is the only real explanation I can offer. Anyway, to the songs - "Perfect Fit" is a really jaunty, catchy piece of jazzy-ish pop. Perfect Radio Two fare. 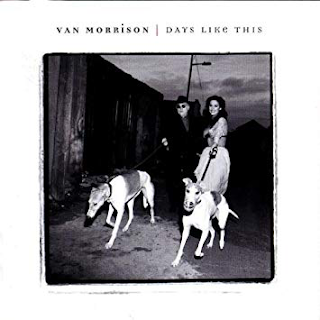 "Russian Roulette" is a typical slice of Van Morrison soul - brassy, harmonica-enhanced, mid-pace and a growling Van vocal. "I've got to go down to New Orleans, I've got to see Dr. John..." Van sings, dropping a name in amongst moaning about hustlers and the like. "Raincheck" has a delicious jazz guitar opening and an intoxicating shuffling staccato beat and Van singing about "moving on onto higher ground...and don't let the bastards grind me down...". We've been there before and there is a feel of the mid eighties material on this this one. The sumptuous guitar continues in the middle too. "You Don't Know Me" is a cover of an old fifties hit and it is delivered here in stylish laid-back jazzy fashion, as Van duets with his daughter, Shana. There is some delicious saxophone on this one. It is a pleasing thing - discovering this album once again. "No Religion" has a great bass line, punchy horns and winning backing vocals with that "call and response" thing Van had going on with Brian Kennedy at the time. "I cleaned up my diction, I had nothing left to say..." sings Van. He continues on the next song to have plenty to say about "Underlying Depression" - he is never far from self-analysing. It has a crystal clear, almost perfect sound, but there is something in the faultless sound on this album that renders it just sightly less soulful than other albums, which is strange, because outwardly, the album is one of Morrison's most blatantly "soul" in its ambience. Some jazzy vibes introduce the brassy "Songwriter" where Van tells us, with a somewhat cynical air, what he does for a living. "Days Like This" was a hit single with a delightful saxophone solo. "I'll Never Be Free" was another old crooner song cover, and another duet with Shana. "Melancholia" has Van ruminating on depression again and he des the vocal thing with Kennedy again. Once was ok, but twice and it starts to get a bit irritating as he literally repeats everything Morrison sings. "Ancient Highway" sees Morrison going all mystical for the first time on this album, quoting "Pagan Streams" from "Hymns To The Silence" and various other Belfast things. He is "praying to his higher self" - this is "No Guru, No Method, No Teacher" stuff. It is good to hear him meet his true muse again as the flute whistles and he enters into a stream of consciousness about the mountains and the ancient highway. It probably lasts a bit too long, but they always do when he gets into a groove like this. "In The Afternoon" is a soulful, romantic number to finish off, with Kennedy doing his stuff again. Thankfully his presence on the next album was toned down, although he blights the "A Night In San Francisco" album somewhat.